FLORA - MURALS - KIDS ROOMS - KIDS ROOMS - BEN 10 - KIDS ROOM MURALS - BEN 10 AND ALIEN HEROES. 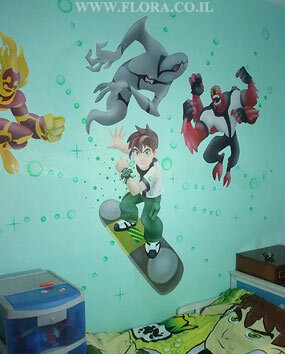 Kids room murals - Ben 10 and alien heroes. Omnitrix Aliens: Heatblast, magma-based life-form, Ghostfreak, Ben`s preferred offensive form Fourarms. Muralist: Flora. Location: Ashdod.